Bach Flower Remedies are 38 Flower Remedies that make up a simple healing system that corrects emotional imbalances with positive emotions. It’s simple, effective and powerful. Flower essences are infused flowers and plant parts. The essences can be used both internally and topically to balance and subtly alter the individuals’ perception, emotions, and outlooks. The Bach Flower Remedies work in conjunction with herbs, homeopathy and traditional medications and are safe for everyone, at all ages and in all aspects of life. Flower essence are non-habit forming, safe for pregnancy, birth, and beyond. In pregnancy, flower essences are particularly useful because many pregnancy symptoms are associated with emotions. It is not uncommon to feel like an emotional roller coaster during and after pregnancy, as there are numerous physical, mental and emotional changes and changes to cope with. Walnut is the remedy associated with adjusting to change whether it is a changing body or a changing situation. Impatiens if you want everything done in a hurry or Beech if it is more other people’s irritating ways that get you down. Crab Apple can help us accept how we look and feel more confident about how others see us. Flower remedies are good for the whole birth team from mother to partner, and doula to provider. As the day of birth gets closer it is natural to feel a little nervous about what is coming. Mimulus is the right remedy for this kind of normal fear of the unknown or Impatiens if you are feeling nervous, anxious or impatient. Clematis promotes alertness and being present in the moment, excellent for unexpected outcomes when being alert is important. Once again, Walnut the remedy for times of change is critical in birth. Star of Bethlehem. is often used if the user feels the need for comfort, safety and protection or if the birth itself has been traumatic in any way. No one should be without the sisters Rescue Remedy and Rescue Sleep. Rescue Remedy has a broad range of uses from daily stress to panic attacks due to a wide range of experiences. This emergency combination contains five individual flower remedies: Star of Bethlehem for shock, Clematis for faintness, Impatiens for agitation, and Rock Rose for terror. Rescue Sleep calms the restless mind that cannot fall asleep due to spinning spiraling thoughts. It removes stress, offering natural relief for occasional stress related sleeplessness. Both are prefect for daily lives but are especially powerful in birth. Postpartum too can be an overwhelming roller coaster ride with hormones fluctuating, a lack of sleep, and new challenges including breastfeeding. And becoming a parent doesn’t happen over night. It is not uncommon to exercise anxiety or guilt if other things get in the way. The working partner may find that career demands force them to take a back seat during and after the pregnancy and the at home parent may feel guilty about deciding to go back to work. Both may try to do too much in an effort to fit everything in and fulfill their expectations of parenthood. Pine is the remedy for guilt helping the user to find balance, while for overwork Oak helps individuals who never low themselves to give in. Agrimony, is the remedy for people who hide their worries behind a smile. Walnut can help the whole family adapt when the newborn turns the house upside down. Holly is the remedy to help where siblings show jealousy or anger towards the new baby. Elm is for capable people who feel temporarily that they can’t cope when there are extra demands made on them. Olive is ideal when exhaustion is a problem when used in combination with another remedy for the root cause. 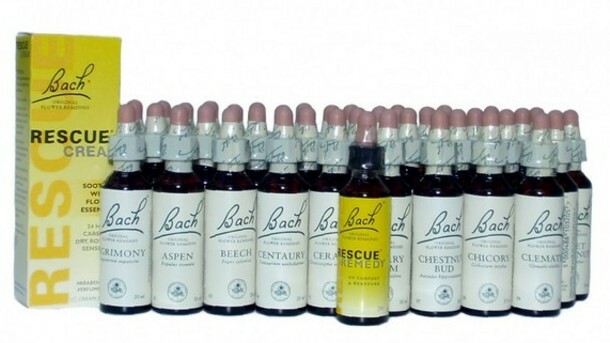 When it comes to actually taking the Bach remedies, there are two main ways. The first is to put two drops of each selected remedy into a glass and top it up with water. You can pre mix as many as seven different remedies together in a designated mixing bottle if desired. Then from this bottle, you take four drops, four times a day. The second way of taking the remedies is to again put two drops of each selected remedy into a glass of water, and then take sips from this throughout the day, four times or more during the day. And if you are adding Rescue Remedy to the glass or mixing bottle, add four drops instead of two.